Tonight on CBS The Good Wife starring Julianna Margulies continues with an all new Sunday November 8, season 7 episode 6 called, “Lies” and we have your weekly recap below. On tonight’s episode, Alicia (Julianna Margulies) and Lucca (Cush Jumbo) defend a client who was fired from a technology firm for failing a polygraph test. On the last episode, Jason used aggressive investigative tactics when he assisted Alicia and Lucca with a student loan case. Meanwhile, Howard Lyman alleged ageism at his firm and accuses Cary as the primary offender; and Eli stirred up Florrick family drama on Peter’s presidential campaign. Did you watch the last episode? If you missed it, we have a full and detailed recap right here for you. Tonight’s season 7 episode 6 looks like it is going to be great and we’ll be updating it live for you beginning 9PM EST. Tonight’s episode of ‘The Good Wife’ kicks off with a woman named Kristen Balko taking a lie detector test, apparently she is the VP of Security at a company called “Running Milk.” Apparently, Mrs. Balko failed the lie detector test – so “Running Milk” fired her. They were giving everyone a lie detector test at the company because someone was selling their secrets to the competition. Balko failed the test – but not because she sold company secrets, but because she lied about something on her resume years ago when she was hired. Now, Kristen is suing “Running Milk” because no other companies will hire her and they tarnished her reputation. Lucca and Alicia learn that Kristen is actually one of Louis Canning’s client – he already filed suit for her and she has to be in court tomorrow, but another case came up for Canning and he thought that Alicia would take on her case. Alicia’s PI Jason gets on Kristen’s case ASAP to do some research and find out if there is anything that Kristen isn’t telling them, and to see if “Running Milk” actually has any proof that Kristen lied on her resume. 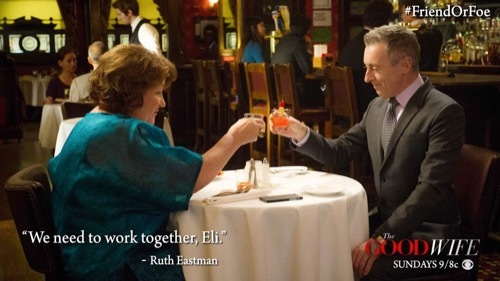 Meanwhile, Eli Gold is still feuding with Ruth over Peter – she tricks him in to having drinks with him at a restaurant by lying and saying that it is a staff meeting. Ruth explains that Peter’s polls are phenomenal, and from now on they are not shooting for vice presidency – Peter is running for Presidency, so that means that Eli and Ruth need to bury the hatchet and work together. Lucca and Alicia head to Kristen’s court date. The lawyer from Running Milk is trying to get the court case transferred to California because that is where the corporate office is – after a screaming match with Alicia in court, the judge sides with Alicia and says that the case will stay in Chicago because that is where Kristen worked, and the office was that she worked at. Back at home later that night, Alicia sits down to Google Jason Crouse. Lucca is concerned about their firm’s Lucca and Alicia head to court in the morning – Jason shows up and says that Running Milk definitely has proof that Kristen Balko lied on her resume, and they can legally fire her for that. But, they had no legal reason to be giving her a polygraph in the first place because there was never a security breach – they made it all up so that they could give their employees lie detector tests. In court, Alicia argues that the polygraph’s were done for no reason. Running Milk’s lawyer reveals that the company has contracts with the government, which means they can polygraph their employees at anytime based on national security laws. Running Milk offers to rehire Kristen at her previous salary, the judge seems pleased with the outcome, but Alicia argues that as soon as they rehire Kristen – they are going to just refire her again once the case is closed. Eli is getting his ducks in order for Peter’s run for presidency. First he visits Alicia and warns her that she may be the next First Lady of the US, Alicia whines that it should be Peter’s job to drop this bomb on her and she thinks that Eli is “up to something.” The next day Eli visits Judge that owes him a favor, he wants information on Frank Landow and the ballot machines last year. The Judge scoffs that he is not going to betray Frank, Eli promises to keep his identity a secret. At the firm, all of the partners are interviewing an intern named Monica – David Lee is not a fan of Monica because she didn’t go to a law school that any one has ever heard of. Howard wants to hire Monica just because she is black, which means that she has apparently “suffered” just like Howard’s people. In court, Alicia and Lucca argue with the judge over the government accounts at Running Milk. The judge dismisses their arguments and says that Kristen Balko will be rehired at the company. The Running Milk lawyer tells the judge that since Kristen’s job requires her to work on gov’t contracts, she will have to take another polygraph test. Since this test is legit – she will most likely be fired the same day that she is rehired. Alicia and Lucca have hit another hurdle, and the case seems dismal at this point. After Alicia gets off the phone, Jason shows up at the office with Kristen Balko. He thinks that they have a new angle on the case. Kristen says that while she worked at Running Milk she was also working on a side project of her own – a relationship mapping app. She found a way to cross it with an app called “spoiler.” Basically, the app makes predictions on its own and may be able to technically predict the future. Back at the firm – Diane, Cary, and Howard are all still arguing over whether or not they should hire Monica. Alicia heads back to court and says that she has a super secret video recorded of Jeff Dellinger – the judge agrees to watch it. Jeff says in the video that “Spoiler” is one of the greatest civilian apps ever created, and Kristen Balko actually created it herself. Then, Running Milk sold her “Spoiler” app to the National Security Agency to use to get intel on terrorists. The judge is definitely interested in the video, but he won’t accept it in to evidence because there is no legal reason that Jeff didn’t leave Iceland and come testify in person. As of right now – Kristen still has to go back to Running Milk and retake the test. Alicia and Lucca haven’t made any progress…yet. Eli gets bad news from the Judge – he got the information he was looking for. The Judge tells him that Peter is going down for tampering with the ballot machines because he was afraid that Alicia was going to lose the election. They plan on announcing it publicly after Landow makes his bid for election. Alicia and Jason are training Kristen on how to try and cheat a polygraph test. They can’t seem to be able to get around her taking another polygraph test, so they are going to teach how to trick one in to passing her. The next day Alicia and Lucca take Kristen to her test. But, they are thrown for a loop when they arrive and learn that a robot is administering the test, so there is no way that she will be able to cheat. Diane meets with Monica and tells her that they have decided not to hire her – the next day a video goes viral claiming that the firm is racist. Apparently Monica was wearing a hidden camera during all of her interviews – and Diane, Cary, Howard, and David Lee were all caught on camera making racist comments, or at least edited to sound very racist. They’re in serious trouble. It’s time for Peter’s big announcement that he is running for president – he and Alicia go live in front of the press and Landow introduces Peter. He announces that he will be running as a Democrat – and thanks Alicia for all of her support. After the press release, Alicia calls Running Milk’s lawyer and tells them that she plans on announcing in front o all of the cameras that Running Milk is in bed with “the next Snowden” and stole the spoiler app. The lawyer caves and agrees to settle the case for $1.2 Million if they claim gender bias. Meanwhile, Alicia is completely oblivious to the fact that her phone lines are tapped and someone is listening in on all of her conversations….